Organ transplantation is one of the most dramatic interventions in modern medicine. Since the 1950s thousands of people have lived with ‘new’ hearts, kidneys, lungs, corneas, and other organs and tissues transplanted into their bodies. From the beginning, though, there was simply a problem: surgeons often encountered shortages of people willing and able to give their organs and tissues. To overcome this problem, they often brokered financial arrangements. Yet an ethic of gift exchange coexisted with the ‘commodification of the body’. 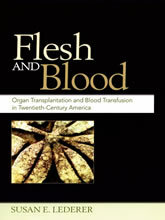 The same duality characterized the field of blood transfusion, which was essential to the development of modern surgery.